A reservation is required in advance to bring cats to the Meow Mobile. To make an appointment, please send us an e-mail or call (305) 233-9958 (E-mail for faster response time). FREE Events (Targeted for free-roaming cats from specific areas) are denoted in *GREEN TEXT* below. *Miami Beach events are FREE for free-roaming cats of Miami Beach. These events are targeted for cats from Miami Beach only. An eartip will be mandatory to receive free surgery. **Little Havana events are FREE for free-roaming cats of Little Havana. 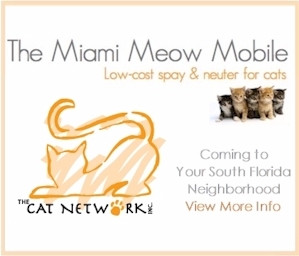 These events are targeted for cats from Little Havana only, and an eartip will be mandatory to receive surgery. ***Surfside events are FREE for free-roaming cats of Surfside. These events are targeted for cats from Surfside only, eartip mandatory. *****Community Hot Spot. This is a day that the Meow Mobile goes into an area of great need to do targeted t-n-r.
Once you have made your appointment you need to fill out and print the “Cat Intake Form” below. This is a fillable form which means you can fill it out on your computer and then print it. If you are unable to manage this, you may print it and then fill it out— being very careful to print NEATLY. Please fill out one form per cat. This form must be filled out COMPLETELY, with NO FIELDS LEFT BLANK BEFORE YOU SHOW UP FOR YOUR APPOINTMENT. Those who have complied with instructions by showing up for their appointments with this form properly and completely filled out will be given priority and served first. Purchase a Spay/Neuter Certificate from The Cat Network. This certificate is accepted at participating veterinarians in South Florida. The cost is $25 for Cat Network members. Miami-Dade Animal Services: Every Thursday and Friday at the shelter located at 7401 NW 74 St. Details here.